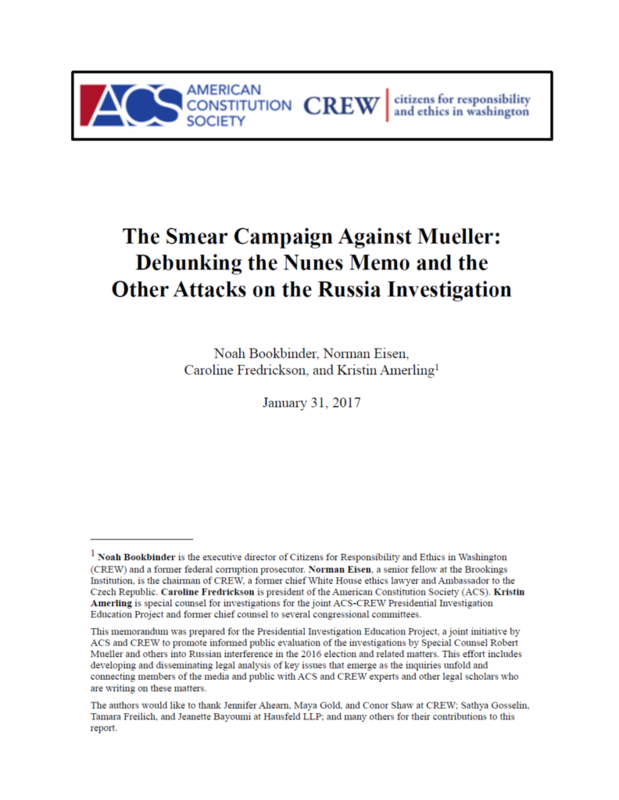 Authors Noah Bookbinder, Norman Eisen, Caroline Fredrickson, and Kristin Amerling examine the facts and law relating to seven major allegations regarding the conduct of the Russia investigation that collectively amount to one of the most sustained smear campaigns against honest government officials since Senator Joe McCarthy’s attacks of the 1950’s. The authors explain why (1) Mueller does not have conflicts of interest that disqualify him from being special counsel; (2) Mueller’s investigative team does not face conflicts of interest; (3) no DOJ employee actions have justified removal of Mueller; (4) Trump transition materials accessed by the Special Counsel likely do not raise privilege concerns; (5) the Mueller inquiry does not turn on opposition research funded by the Clinton campaign; (6) Representative Devin Nunes’s memo claiming that the FBI improperly obtained a warrant to conduct surveillance on Trump campaign officials lacks credibility; and (7) an additional special counsel is not warranted under applicable law. Although this inquiry is still unfolding and any assessment is necessarily preliminary, the report concludes that based on what is publicly known, the Special Counsel has conducted an inquiry that fully complies with relevant laws, rules, and guidelines – and that is wholly consistent with Mueller’s reputation for playing by the book. The White House May Claim Mueller Has Conflicts of Interest. Oh, the Irony, The Washington Post. ACSblog: Irresponsible to Attack Mueller for Exceeding his Mandate?